This is the 9th of twenty-one lessons for design students, gathered from the combined experience of being a student, and teaching students. I will published one lesson each weekday until they’re done. Today is not the first time I’ve written about this principle here. I first discussed it four years ago, within an article inspired by Texan artist and writer, Austin Kleon. That article was the 10th in a series of lessons to my younger self, a series that now numbers 38, this article included. I discussed it again two years ago, within another article exploring the nature of experimentation and its role in the work of my practice. Clearly, it’s a principle close to my heart. Architectural ideas require a reference frame to be understood. If your idea is to take a shape and transform it into something new, using an unidentifiable blob is no help at all. 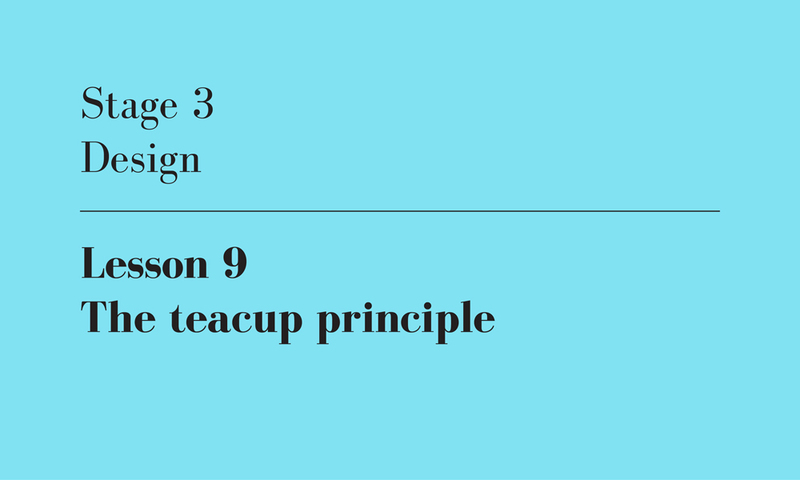 Instead, use an instantly recognisable form, like a teacup, so that the changes you make can be perceived as having originated somewhere. This principle concerns itself with the intersection of your design process and your form making. To be precise, it’s about imprinting your process into your form so it can be perceived and understood. This is a critical step in your design project this semester. It’s the moment when you start giving shape to your ideas, and emerge from the realm of thought out into the realm of objects. Committing to just one of the infinite formal possibilities that could express your ideas is a huge effort. Getting it right is the true mark of a great architect. It proves that you are in control of the tectonics of architectural form, that you understand space and structure and material, and can bend them to your will. The key to the teacup principle is to ensure that your ideas aren’t lost in their metamorphosis into built form. Take an object of fragmented geometry, twist it and explode it. Now it’s just another object of fragmented geometry, and your design intervention is drowned. Take a china teacup instead, turn it upside down and paint it red. Now it’s an upside down, red teacup. The actions of your design intervention are powerfully evident because they’ve begun with such a banal object. The teacup principle, author’s own image.